Bus Operations is the surface transit division of the Metropolitan Transportation Authority (New York), created in 2008 to consolidate all bus operations operated by the MTA. Originally known as Regional Bus Operations after the 2008 consolidation, the branding was later changed to reflect the contract termination with Long Island Bus, now operating as NICE. The fleet consists of more than 5,900 buses of various types and models for fixed-route service, providing service in New York City, the western edge of Nassau County and the city of Yonkers. Bus Operations is not currently publicly used as a brand. 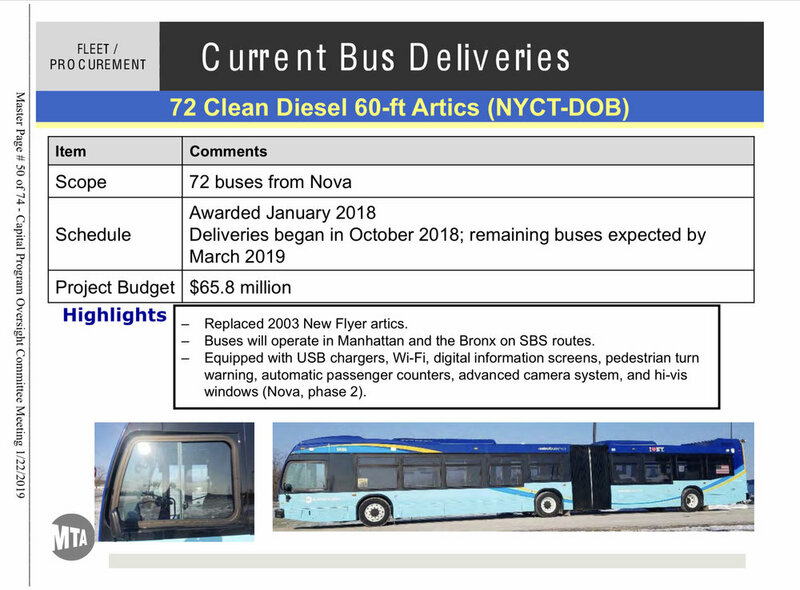 The NYC Transit Forums Fleet & Depots home page is updated on a regular basis, and serves and the main information page for Department of Buses operations. Bus Operations is currently in the process of merging it's branding, operations, radio and farebox systems. The combined branding has been introduced, and will continue moving forward with all new buses which will share a common unified MTA New York City Transit & Bus brand, that no longer sports NYC Bus or MTA Bus titles. The current public brands are New York City Bus, and Bus. The merged ops branding has been revised and will now be known as New York City Bus for all public purposes, across all divisions. The TTMG Insiders Guide (Fleet and Depot Roster) is a comprehensive depot-by-depot fleet guide that is the maintained by MTA personnel, and is accurate at the date and time posted (save any typos or human error). Public updates are released regularly. Please remember that buses are transferred, loaned, and borrowed on an as needed basis. Reference the MTA Bus Moves & Transfers Thread for daily updates, and interim fleet information. The following information comes from "East New York", "The Real", and “SevenEleven” via MTA Bus Operations. The New 45 foot Express Bus Test & Evaluation Program. MTA has had time to evaluate the data collected during the demo testing phases for the 2 express coach models listed below. MTA is now in the selection process for the next express order. RFP's have been issues, and the first order is due By April 2019. It is expected that MTA may now award both NYCT and MTAB orders together at the same time. 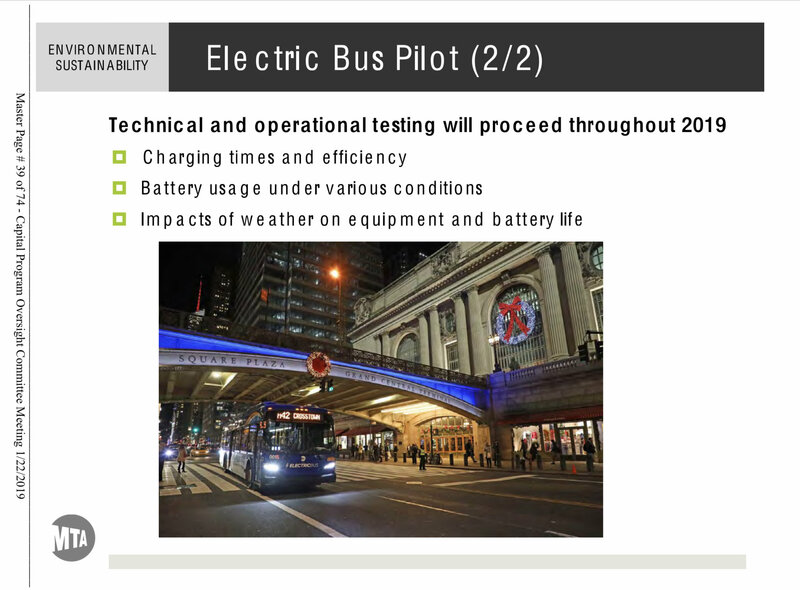 The Standard 40 foot electric bus alternative energy Test & Evaluation pilot. 0011-0020 At this time, New Flyer has completed the necessary testing to validate the bus for NYCT operations. 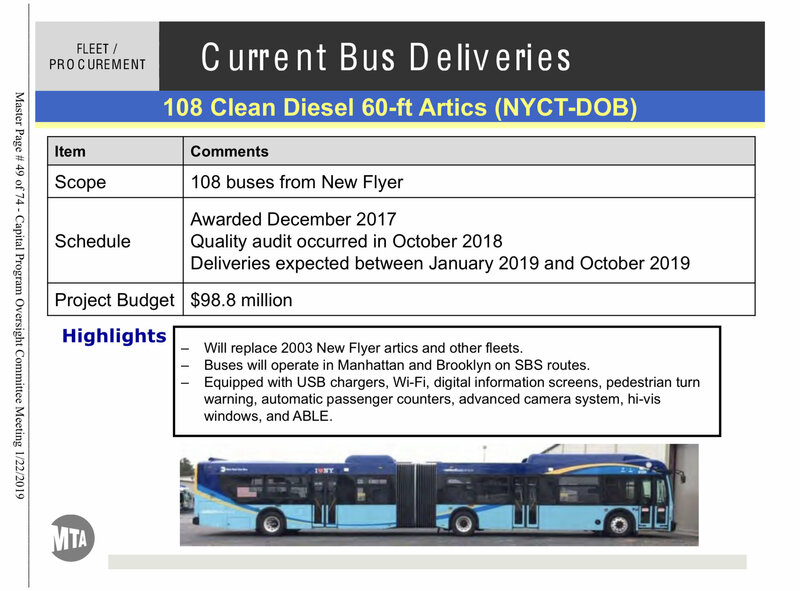 Effective February 2019, MTA began the spec design phase for the new buses. Proterra has until October/November to qualify its bus for procurement consideration. 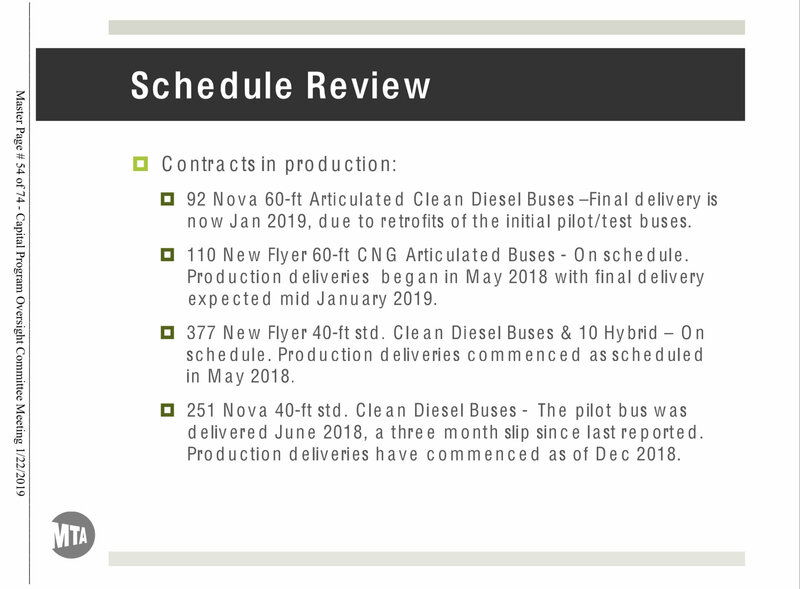 At that time MTA will have made a decision moving forward with production immediately in December 2019. 6234-6286 (53) 43 for Q52+/Q53+ @ LaGuardia, JFK, and Far Rockaway Depots. 10 for service expansion. Buses are expected to be delivered in the order above, but does not mean full allotments in order. Just delivery starting order. New Flyer XDE40 "Xcelsior" Low Floor Diesel-Electric Hybrid (Awarded Delivery almost complete- 5 Allison units, 5 BAE units) Note Grand Avenue depot was selected for initial test and evaluation as that depot now serves as Bus Operations Engineering Headquarters. These buses will serve as Test & Evaluation pilot models that will be used to decide the configuration for the confirmed future order of 275 hybrid buses. Please Note this could be a split award between New Flyer and Nova. Evaluation is scheduled to wrap up at the end of 2019, with production buses to begin construction in December 2019. Pilot testing is in the final phase, which is spec design of the production buses. At this time, the buses will now begin evaluation at other depots. 9500-9504 feature the new Allison H 40 EP Hybrid system. 9505-9509 feature the new BAE Systems HDS200 Series-E HybriDrive, which is the successor to the hybrid we currently have on the Orion VII hybrids. 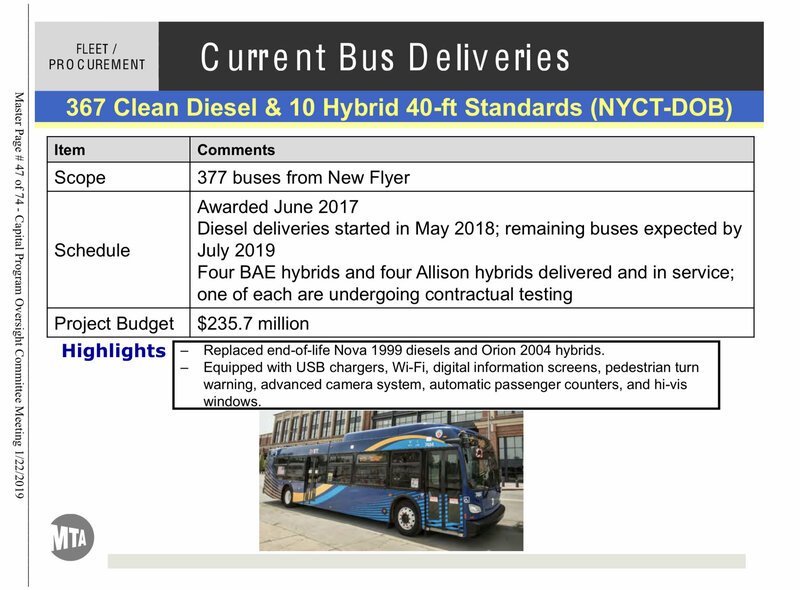 Please note 1-3 of theses buses will be eventually used for duty cycle testing throughout all 5 boroughs on various routes out of multiple depots, to evaluated both electric operations and articulated electric operations in other areas. This will help MTA gather data to help with deployment and analysis for the pending order of 45 standard AEB’s. Notice: Dates of award, delivery schedule, depot assignments, fleet numbers and all technical details subject to change without notice. All information will be updated accordingly. -Transfer Thirty-Three (33) 2006 DaimlerChrysler Orion 07.501 Gen-II+ Hybrids by 2020 from NYCB. -Order 25 New 40-foot Buses for 2021 delivery. 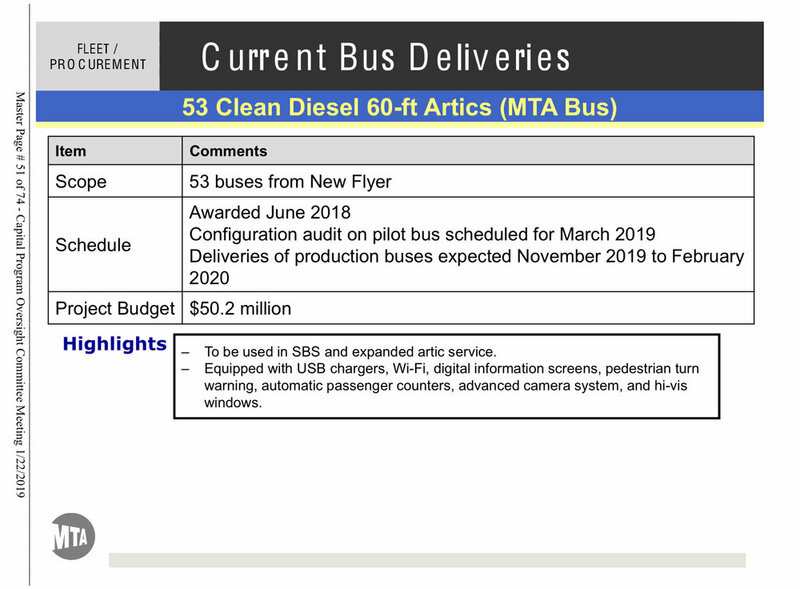 -53 New 60-foot Buses for 2019-2020 delivery. -Order 257 New 45-foot Commuter Buses for 2021 delivery, with the first 174 arriving in 2020. -Retire all 2004 MCI D4500CL Commuter Coaches by the end of 2020. -Retire Two Hundred-Thirty Seven (237) 2005 MCI D4500CL Commuter Coaches by the end of 2020, with 154-units going by the end of 2019. -Order 275 New 40-Foot Hybrid Buses for 2021 delivery, with the first 77 arriving in 2020. 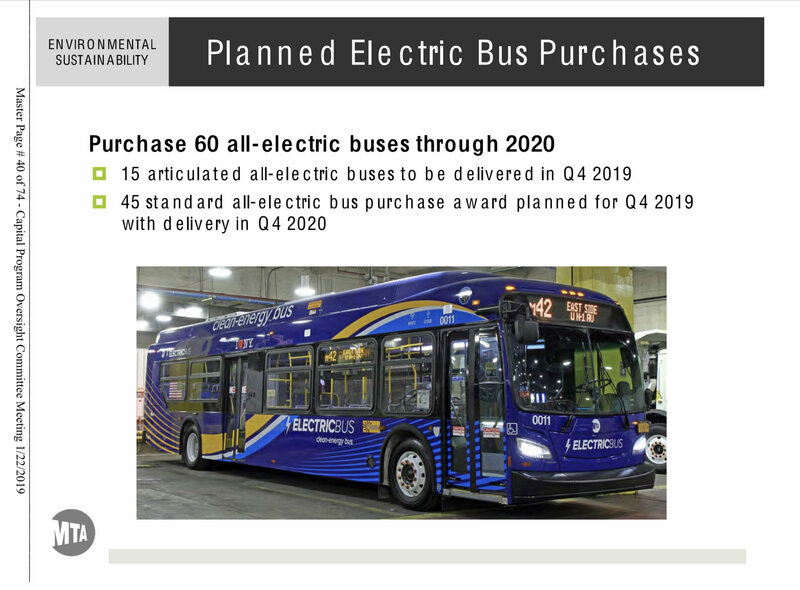 -Order 45 New 40-Foot Electric Buses for 2021 delivery, with the first 6 arriving in 2020. -Order 50 New 45-foot Commuter Buses for 2020 delivery. -15 New 60-Foot Articulated XE60 AEB for 2019-2020 delivery. -Retire all 1998-99 Nova Bus Model T80206 RTS by the end of 2019. -Retire all 2002-04 DaimlerChrysler Orion 07.501 Gen-I Hybrids by the end of 2019. -Retire all 2003-04 DaimlerChrysler Orion 07.501 Gen-II CNGs by early 2019. -Retire all 2005 DaimlerChrysler Orion 07.501 Gen-II Hybrids by 2020, with the first 158 retired by the end of 2019. -Retire all 2006 DaimlerChrysler Orion 07.501 Gen-II+ Hybrids by 2020. -Retire all 2007 DaimlerChrysler Orion 07.501 Gen-II+ Hybrids by 2021, with the first 75 retired by the end of 2020. -Retire all 2008 Daimler Orion 07.501 Next Generation/Gen-III Hybrids by the end of 2022, with the first 158 retired by the end of 2021. -Retire all 2002-03 New Flyer Galaxy Articulated (D60HF) by mid-2019. -Retire all 2002 MCI D4500 Commuter Coaches by the end of 2020. -Retire all 2007 MCI D4500CL Commuter Coaches by the end of 2022, with the first 28 retired by the end of 2020. For more in-depth details about the current bus fleet, please reference the TTMG MTA Bus Fleet Summary. 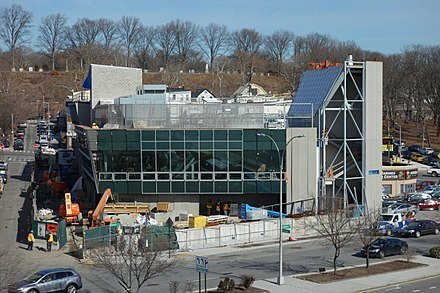 *East New York - MTA Surface Transit Headquarters- Currently in the final stages of exterior construction, the brand new state-of-the-art facility for the merged bus operations of NYCTA and MTABC. The new building will be located and constructed at the East New York Bus Depot site, which currently serves as MTA's Surface Transit Operations Headquarters. This facility will feature brand new bus dispatch capabilities which will be merged with MTABC, as all buses across the fleet will have their radios replaced for one common system. This will begin the much awaited official merger of New York City Transit's TA and OA divisions with that of MTA Bus Company. All buses will also have their fare-boxes replaced for units that will be common to both Transit and Bus Co. In addition to the new command center being scheduled for full operations by Summer 2020 , ENY depot is currently being modified to house and maintain articulated buses. The depot is scheduled to be rehabbed, and artic ready by June 2020 as well. **See photos of the new command center below. Updated photos of the newly complete building coming soon. *Jackie Gleason - In an ongoing effort to increase capacity along the heaviest used bus lines, Gleason underwent modification for articulated bus operations. The B35 line was converted to full-time artic operation in September 2018. The depot also began a complete upgrade of its CNG facility and components. This depot upgrade and rehab is scheduled to be complete by April 2019. *Jamaica - Construction of the new Jamaica Depot is now in the final phase of planning. These discussions include the finalization of the design, the acquisition site preparation, and the overall logistics of the new depot. The official project completion date is now expected for 2020 even though it is currently behind schedule. The existing depot will be demolished, and a new expanded building will be replaced in the current location along with newly purchased property adjacent to lot in order to facilitate expansion, and articulated bus operations. Preliminary plans for for the closing of the depot to be "transitional," so service will not be interrupted in any type of major ways. Final depot design is slightly behind schedule and now expected to begin the completion process in Summer 2019. *Manhattanville - Preliminary reports now show MTA will soon begin the planning for upgrades of the Manhattanville Depot in the West Harlem section of Manhattan also known as Manhattanville. These upgrades will make it the "greenest" depot in New York City. In short, the depot will be transformed into a state-of-the-are High Energy Efficient Facility. Additional details coming soon. The project is expected to be complete in the Spring of 2020. As MV was one of the first depots to feature an all-alternative-energy fleet, it will be one of the first to implement the next hybrids, as well as future electric bus models. New Command Center photos courtesy of ENY, ENY Depot, and MTA Bus Operations. Back off an extended vacation......... Give me a few days to get the updates together and compiled...... My apologies, but I have been very busy in my career..... Some bus related and we will get to that as well. .
Dante's Inferno, that's a good handle. Major Updates for bus orders. The pilot bus for the New Flyer Xcelsior order has reportedly failed its initial audit inspection. This is not uncommon, and should not have any impact of an on-time delivery for the order, which will run through 2016. The first pilot is still expected on MTA property in the coming days. The scheduling for award has changed once again for the next bus orders as well. 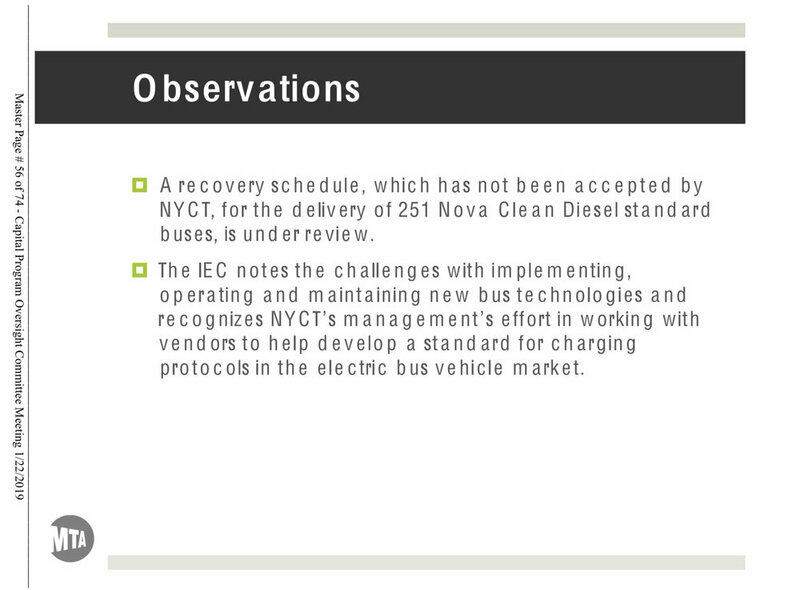 Effective immediately, MTA expects to award all 331 articulated buses at the same time. 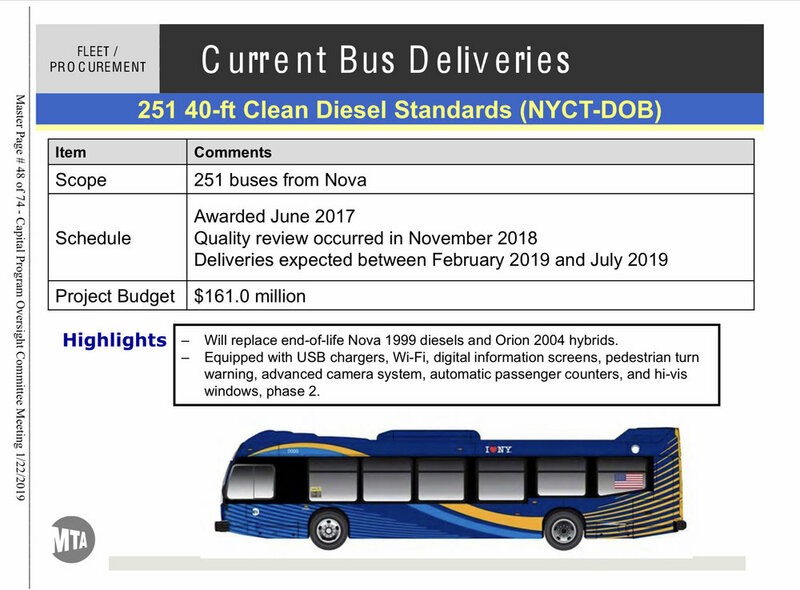 Originally planed to be split into 2 separate projects, the award is now projected for December at the latest, with the entire MTA Bus fleet to be delivered by March of 2016. This will also include the 45 standard 40 foot buses that will be awarded at the same time as well. Delivery of the first pilots are expected in the 3rd or 4th quarter of 2015. Smh, how does New Flyer fail? I give up with that company. I wish Nova made the Xcelsior. Well then, I'm sorry New Flyer. The way you said it made it seem as if they failed something so simple. Do you know exactly what they get tested on, for the MTA to be so strict? Everything that is specified in the RFP specifications, so to put things in context a bus could be failed for something as simple as a sticker missing or in the wrong place. That is 100% correct bro. MTA is that definitely the agency that will fail you for a sticker. I don't think the Bronx will get XD40s, I think Queens, the Bronx, and Manhattan will get LFS (since they have the LFSAs), while Brooklyn and S.I get Xcelsiors. There will be a lot if shifting, just because these buses will replace the Orion Vs/RTS doesn't mean those depots will get the exact new buses in return. And this order is only for NYCT not MTA Bus. It was canceled. See the first post in this thread. TA ordered enough Prevost buses to bump a few MCI's over to Bus Co.
Not at all. Word is East New York is confirmed, as well as a few others. I will get into fleet replacement later on this weekend, and which depots are expecting new buses. 5. MTA bus 45 standard buses company unknown right now and 75 Articulated bus which we don't know what company is making them. 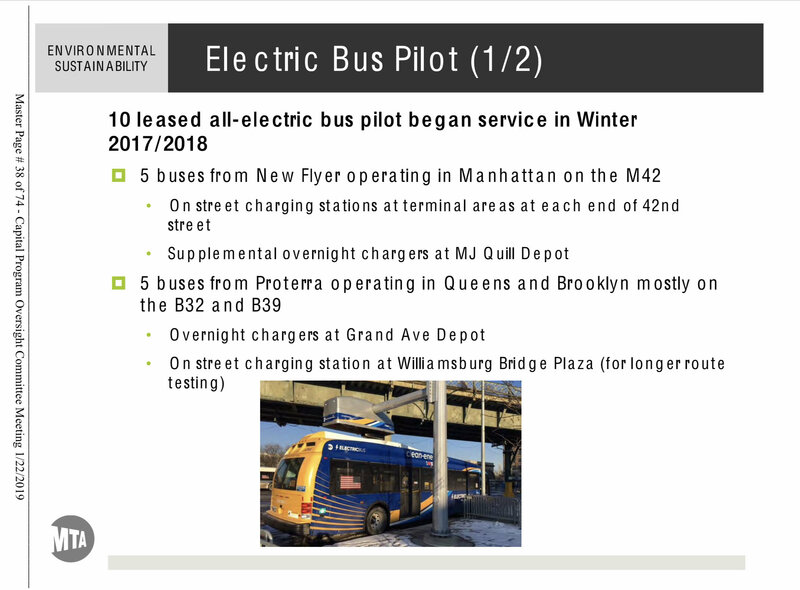 These buses are suppose to come in 2016 as well as the MTA bus orders, correct? I got one for the order for Jamaica Depot order for 2014 Nova Bus LFS in Queens for replacing 1996 RTS Nova Bus first I can say .. So altogether Jamaica Depot got #8045 - #8135 ( 90 buses ) to replacing 1996 RTS Nova Bus order first I would say.. Guess can come reality. Effective immediately, posts in this thread will no longer be deleted. They will however continue to be removed from this thread and archived in a new section for future reference. This is the only thread where posts had been deleted in order to keep focus on the opening post, which is updated regularly. 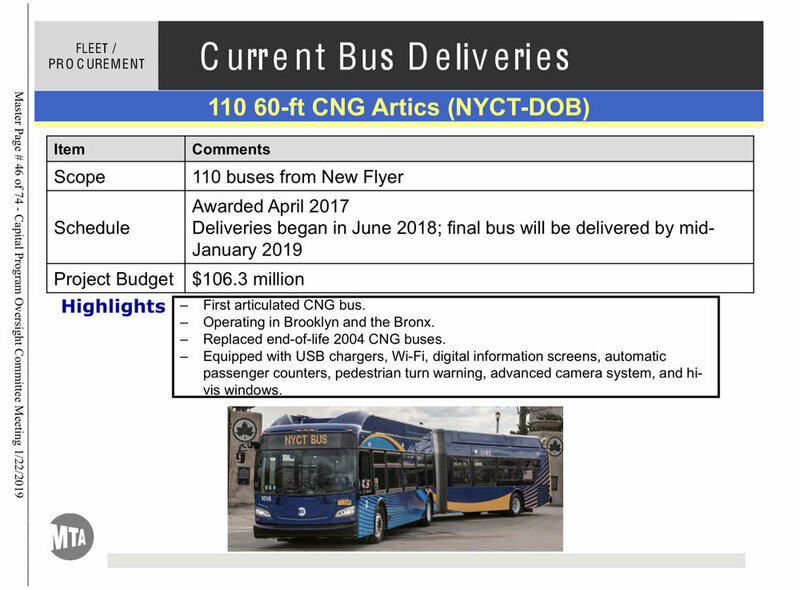 Most all pre-1999 buses will be retired with the exception of a few Orion and RTS buses that will either be added to the System Storage Reserve Fleet, museum fleet *cough* , or shipped over to LaGuardia Depot. You have the upcoming orders correct with the exception of #4. As Fresh Pond said, the artic order has not yet been announced. However, MTA has decided to re-evaluate the order process for the next buses and award them all at the same time now. This means MTA knows exactly who the orders are going to at this time. However, I am not able to speak on all of that, and MTA will not make a final decision until the final selection process. The reason being, it is just about time for Best and Final offers from New Flyer and Nova. The TA has been in discussions with the manufactures about the new buses for a while now. 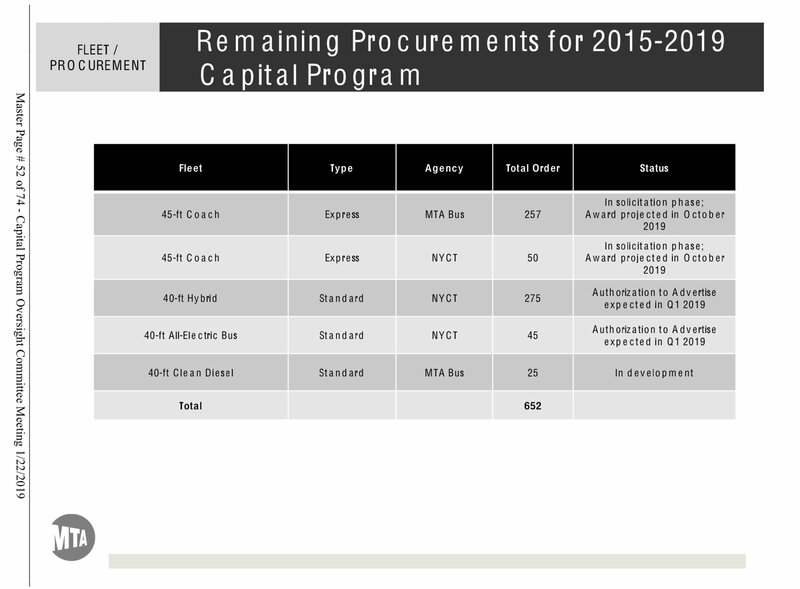 MTA decided to review the new orders and change the process for procurement. Originally, there were 3 RFP's issued. 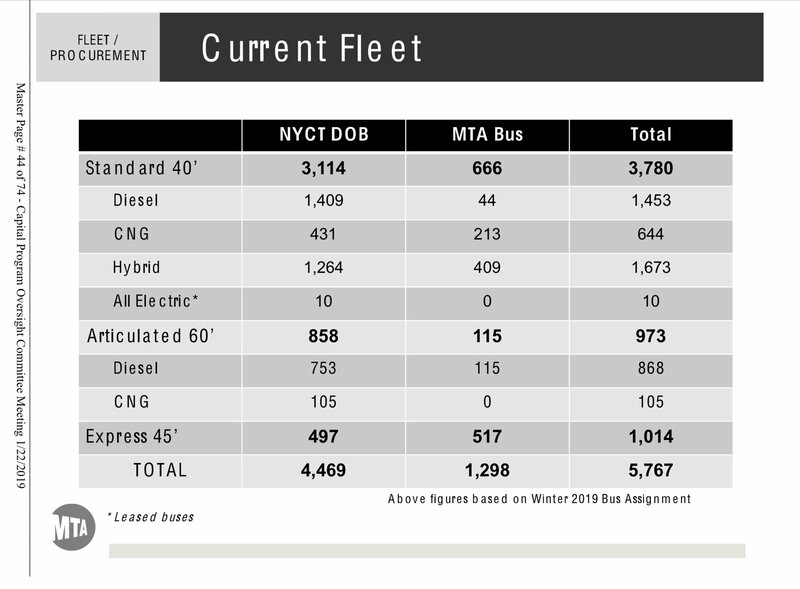 256 artics for NYCTA, 75 artics for MTABC, and 45 standard buses for MTABC. The first for the 256 artics was issued alone, then the one for MTABC buses was issued later. MTA has now decided that it is in their best interest to award all 331 artics and 45 standard buses at the same time, as they will likely get a better contract (for the artics). The more buses you order at once, the lower the costs associated. One of the only exceptions to this rule is the introduction of a new bus platform, which requires new parts, new logistics, and new maintenance and driver training. It is also being said that MTA is open to the option of splitting the artic order, but is is almost certain that the standard bus order will be sole-sourced. The contract will call for MTABC to take delivery of their buses first, with all 75 artics and 45 standards to be delivered by March of 2016. Delivery of Prevost express buses will conclude by June 2016. 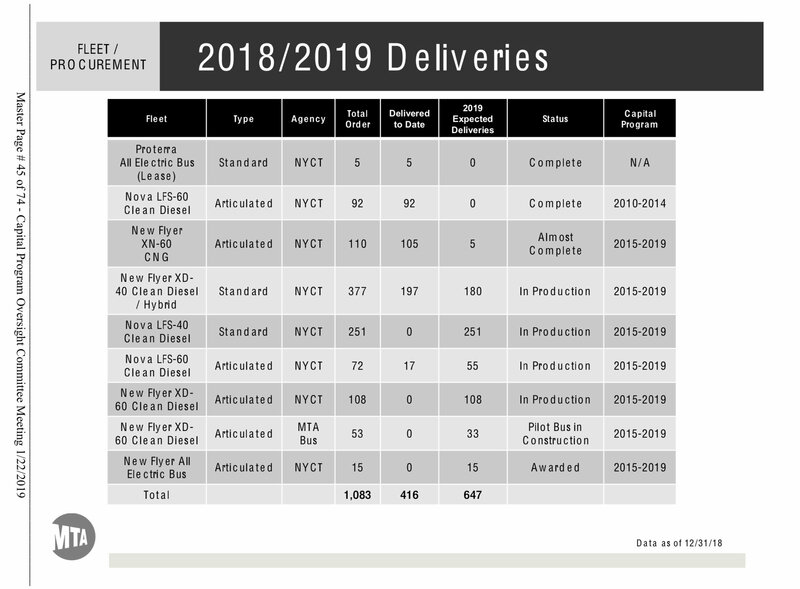 The remaining 256 artics for NYCT will see a delivery schedule that will stretch into 2017. *** I broke news that MTA was getting ready to embark on a new testing program that was something we had never seen before. They would order 90 buses each, from select qualified manufactures, and put them through a rigorous head-to-head test program. Backlash: Not one single person on any transit forum from here to SubChat believed me...... Then MTA announced the details to the public 8 months later. *** Following the 90 test fleet post, less than a month later, I announced that New Flyer would be awarded a contract for C40LF buses. A bus model that at the time had already been discontinued. The backlash for this one was the most I had ever got because it ended up affecting multiple companies. Because I had gotten the information right as the ink was drying on the contract, I had no clue when I announced the order right here on NYCTF, that MTA had not yet informed New Flyer that they had won! This started a domino effect. I was directly contacted by New Flyer almost immediately as they had not been informed of such news. I laughed, told them to wait till Monday, Congratulations, and welcome back to NYC. That's one of the most infamous phone calls of my entire transit industry career. This is when the crap hit the fan. What happened next was SEPTA got word of my post and started to investigate. They originally wanted more LFR buses, yet were informed by New Flyer that the model was discontinued. When I mentioned that the only way MTA would award the contract was if they were LF models and not the redesigned LFR as they would not qualify the bus unless it went through the brand new test program that no one believed even existed. So things started to pile up and it got more crazy. Even SEPTA thought I was making some grand claim just to draw members to NYCTF, and initially dismissed it themselves. Once they confirmed it was true, their relationship with New Flyer has never been the same. Once an all next gen New Flyer operation, SEPTA is now ordering buses from Nova. At that time, I had confirmed New Flyer would resurrect the LF for MTA nearly 6 months before the first bus rolled off the line. Still, not one person believed me. Then 230 was delivered. For those reasons as well as quite a few others, I took a leave of absence from the forums. Now that I am back, I will post certain information when I feel it is important or needed. I will not argue about anything that I post. Should anyone disagree or be skeptical, it is ok to debate, add your opinion or a correction. However, I am not obligated to explain anything or list a source. I don't owe this information to anyone. The general public is NOT entitled to all the inner workings of the MTA prior to them being public. Especially when it comes to contract procurement. This is a privilege. That being said, the next orders are pretty much decided. However, as not to cause any confusion between any bus manufactures or within the MTA, I will no longer announce to whom a contract will be awarded until I receive an official go-ahead. I will continue to post all other news, updates and exclusives as I always have. I am also working on a new platform for keeping track of bus, train, and depot projects. For now, please continue to refer to the first post of this thread for Bus Operations information and news. Didn't the also get lucky since CTA canceled their last order for LFs? Yes. That was actually the only way the order was still possible because NFI was left with excessive parts for the LF once CTA cancelled the remainder of their order, and decided not to take any options.